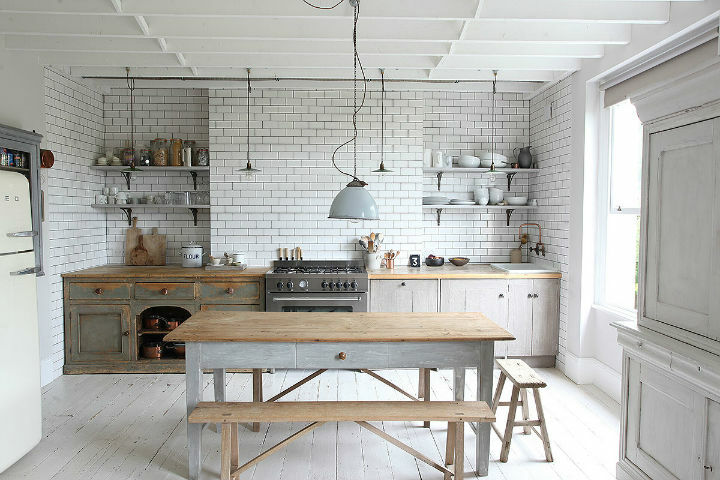 The distressed look has become the darling of interior designers. 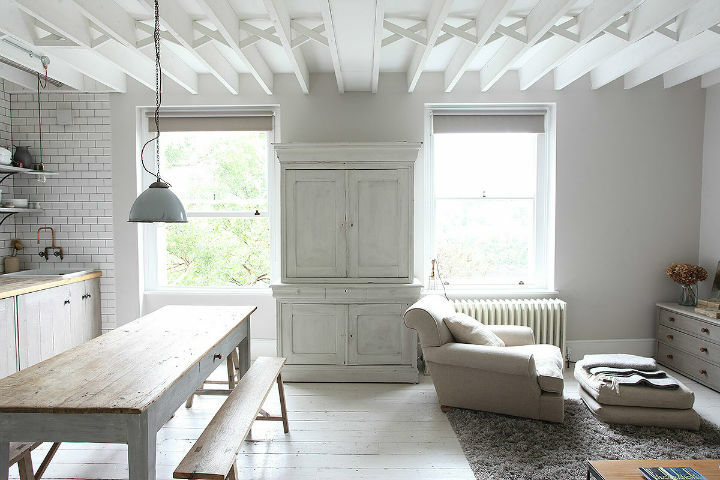 It makes sense, as distressed furnishings are extremely versatile and look absolutely ravishing when done properly. 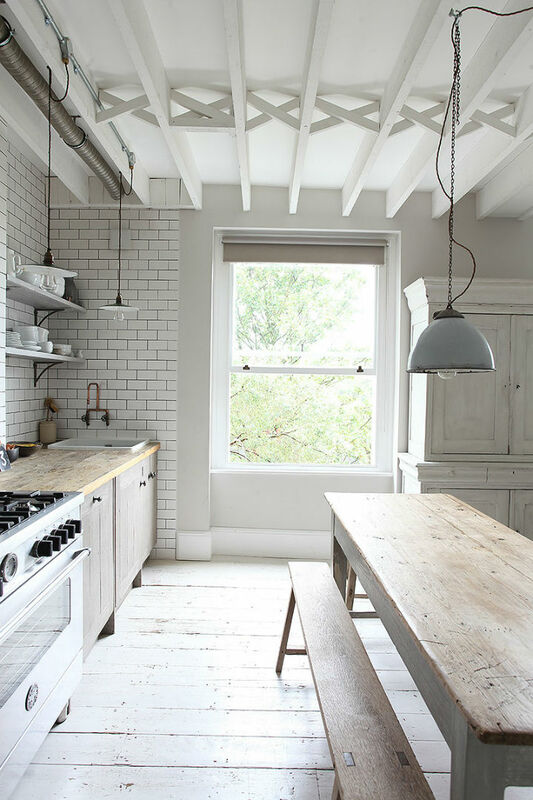 When placed against an all white backdrop, like in the kitchen of this home, a distressed interior can be soft, practical, elegant, contemporary with hints of bohemian chic, or virile. In fact, this type of interior theme is more about personality than style. There is a technique; however, the concept must come from a creative sense of personality coupled with good taste. 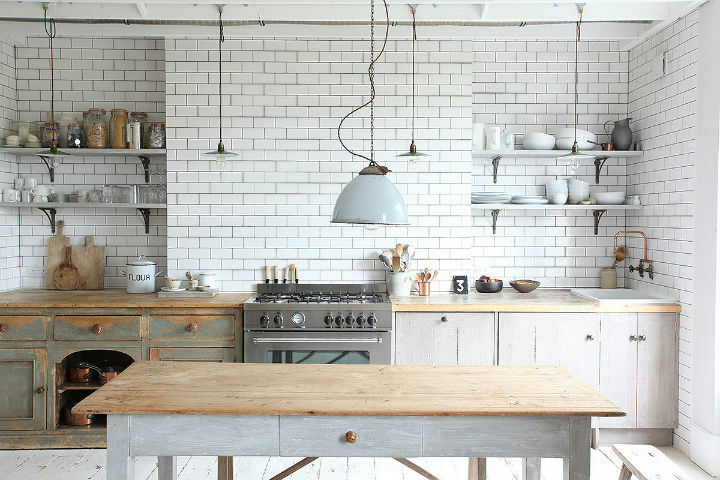 Emphasis of French accents produce a slight antique appeal in the kitchen area. 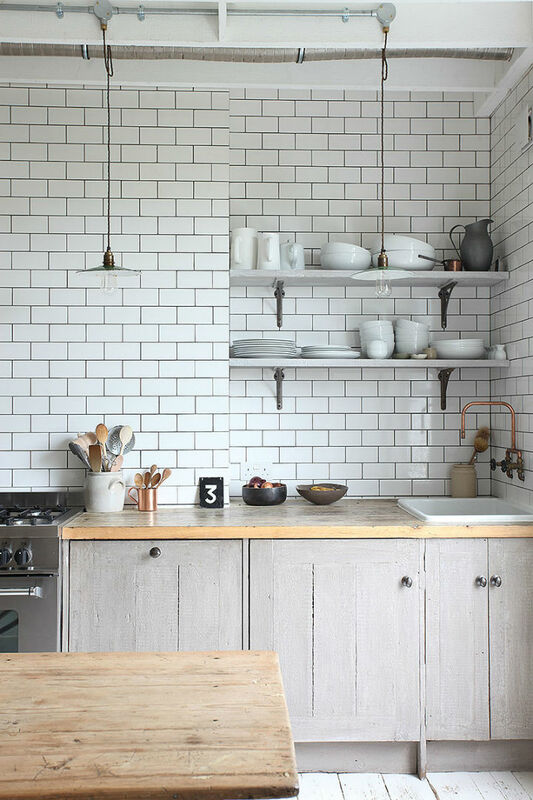 White cabinets have a traditional style and complements the otherwise contemporary layout. To add more texture to the décor, the table legs, tabletop, seating, and counter top are constructed from a light colored wood that flawlessly blends with the distinctive interior decoration. 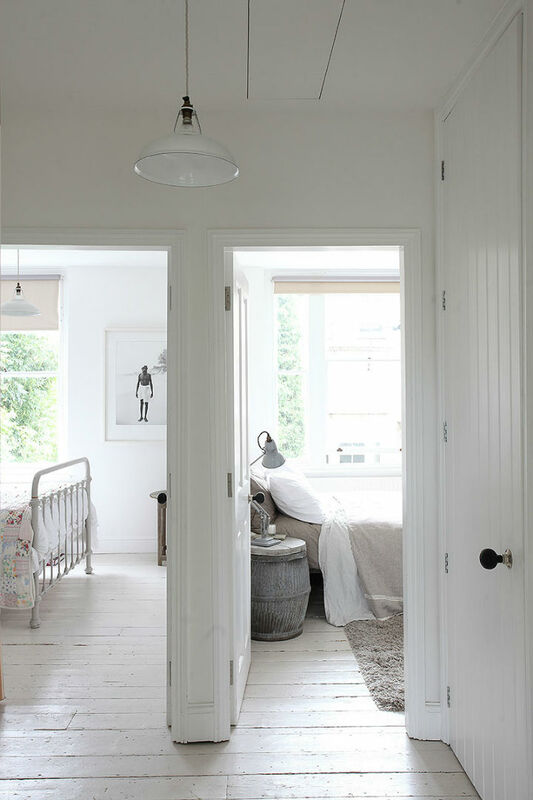 Thin white beams add an attention-grabbing dimension to the ceiling, while the complementary white wooden floor is impressive and bare. This is not an easy floor to maintain and requires extra care to keep its beautiful appearance. 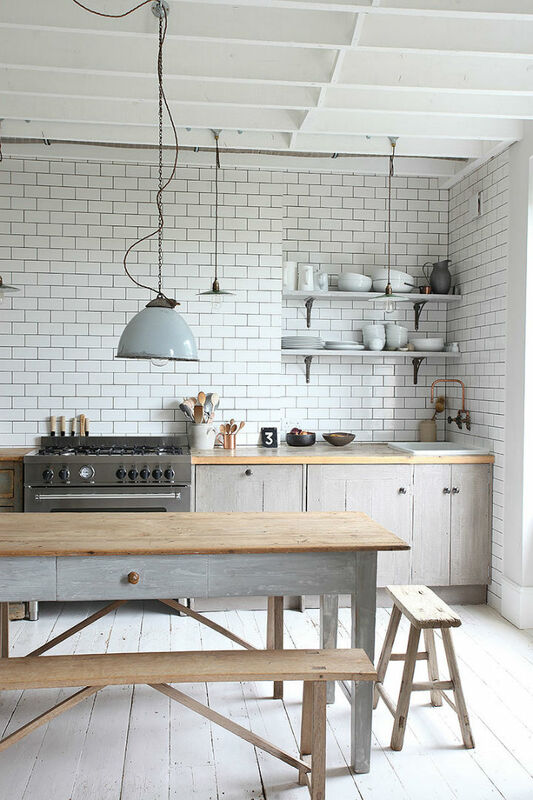 The Pewter hued stove and subway tiles create a modest industrial look. 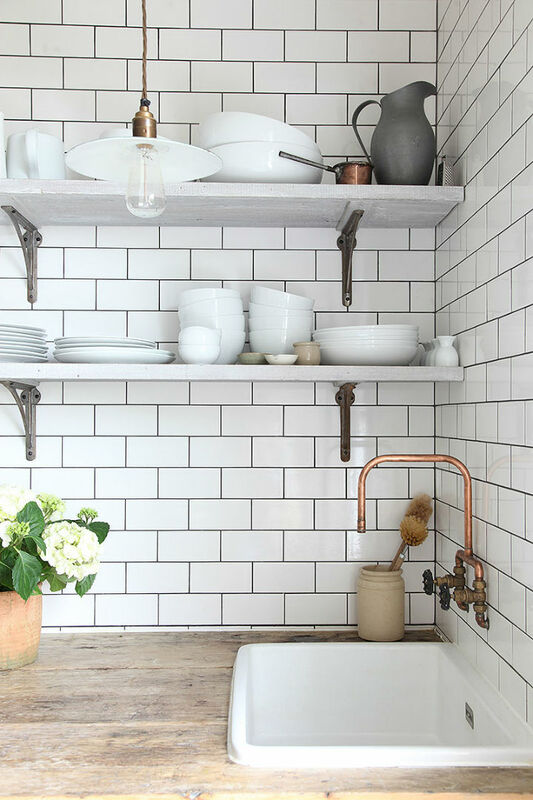 Pottery and various accents, including copper, complete the overall appearance of this practical kitchen that oozes individual style. 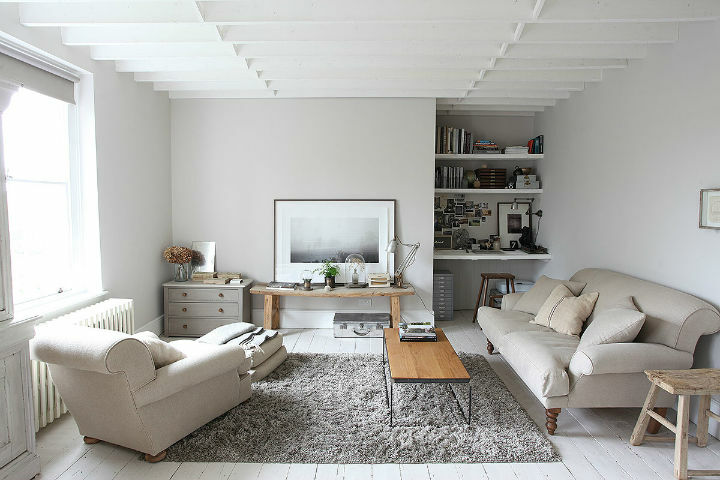 To make small spaces appear larger, white is the ideal neutral color to use. For example, white is cleverly used in this apartment and creates the perfect balance in proportion to the size and layout of the space. Feng-Shui concepts are utilized to allow the space to flow and provide adequate movement in the living room area. The style of this residence is constructed around a demand for quiet and tranquility as there is no TV or other audio in the home. The ambiance seems peaceful and welcoming. In addition, the ecru colored sofa, accent chair together, and shag accent rug add a feeling of warmth. 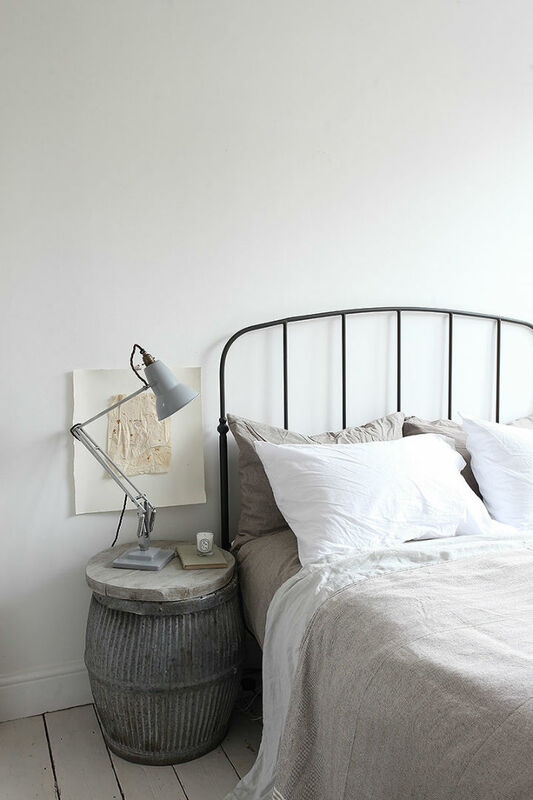 Two bedrooms extending from the main area continue the distressed modern theme. 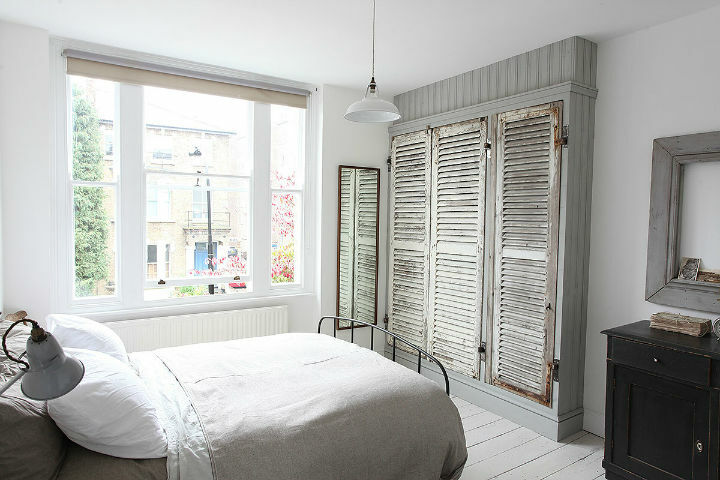 The built-in shuttered closet conveniently situated in on one bedrooms is like a piece of wall art. 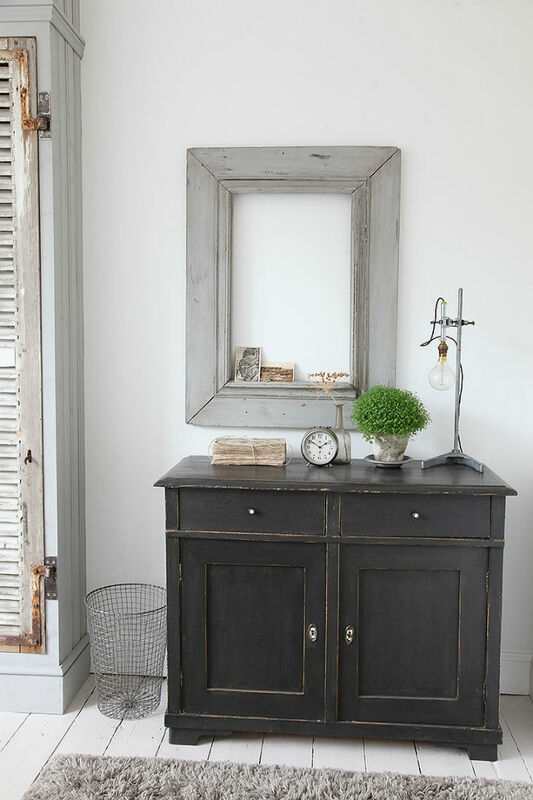 Dressers and mirrors are simple and distinctive. 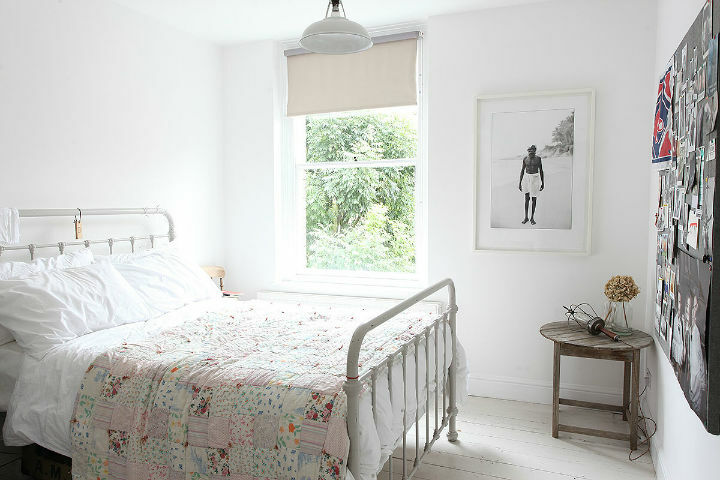 The décor of both bedrooms is neutral depicting a calm, restful ambiance. Large crystal clear windows allow natural light, subtly illuminating the space. 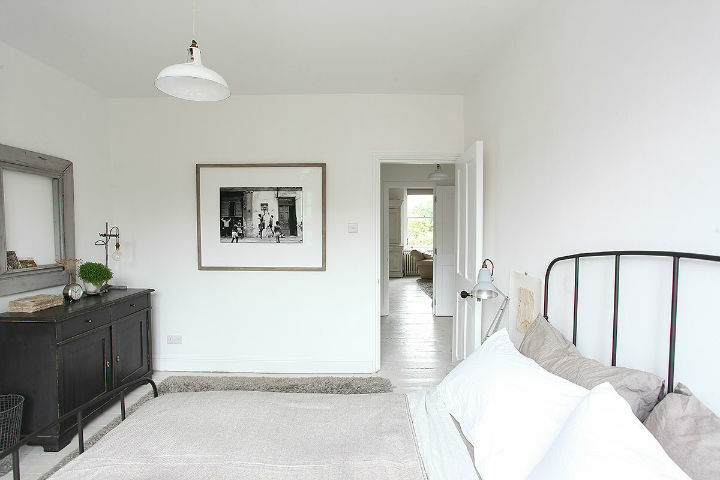 Both bedrooms are beautifully designed with minimal furnishings for ultimate comfort. Homes can be filled with beautiful things, but interiors should also include items that have a special meaning to whomever inhabits it. When a home is filled with accoutrements that touch the heart, others can feel it. The effect is a feeling of individualism and authentic style. Living beautifully is about living with what suits your lifestyle, and this home represents the concept flawlessly!